One of the primary reasons to create custom step is to be able to setup the initial state of an element right. This often means setting up the right types of mappings. This document shows how to set up default mappings and discusses the different types of input mappings that you can set. After creating a step ( see Flow Steps (Advanced) ) you need to have your class inherit and implement IDefaultInputMappingStep . The implementation of this interface returns an array of IInputMappin . An IInputMapping describes the type of input you are setting and the value for this input. Below is the type of input types and examples on how to build them. Explanation	: This mapping type allows you to specify a constant value for your input data. Explanation	: This mapping type does not send in anything for the selected input. Explanation	: This mapping type explicitly sets the value of the input to null. Explanation	: This mapping type allows you to select a variable from within your flow or rule to use as input data. The key to setting this in code is to know the DataPath of your variable (see example code below for how to form a DataPath string). Explanation	: This mapping type allows you to merge strings as plain text or as HTML. To select between plain or HTML merges set the value of MergeResutlType accordingly. The value of this is an enum of DecisionsFramework.Utilities.Data.MergeDataType which can be either .PlainText or .HTML. Explanation	: This mapping type sets the value to the current date/time at runtime. Explanation	: This is a complex mapping type that allows you to calculate a date based on another date. In the example below OffsetMapping is set to ConstantInputMapping and DateTimeMapping is set to CurrentDateInputMapping. But both of these could be set to any mapping type that is value for single date inputs. Explanation	: This is a complex mapping type that allows you to choose a flow to convert the value of a variable and then use the converted value as your input. The key to setting up this input type is to know the FlowId of the converter flow you want to use and to know the names of the input data that flow takes in. In the example below the ConverterFlowId value is set to the Id of a converter flow that is delivered with every installation of Decisions, the Convert String to Int32 flow. Also in the example below, ConverterFlowMappings is built using ConstantInputMapping, but any mapping type that is valid for the data type of the input data would be OK. e.g. if your input data was a date, you could use a DateInputMapping input type. Explanation	: This mapping type allows you to set the mapping type/value for each item in an array. Each item can have a different mapping type. Explanation	: This mapping type allows you to join two or more arrays into one as your input. The individual arrays can be built using any mapping type that is valid for an array. Explanation	: This mapping type is a special version of SelectValue input type. 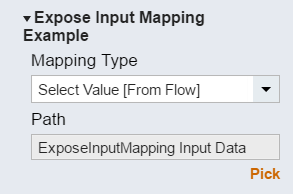 When used, it automatically creates a piece of input data in your flow named as the value specified in ExposeAsName, and then selects that input data as its value. The exact same thing could be accomplished by manually adding the input data to the flow and using Select Value to select that input data as the value.